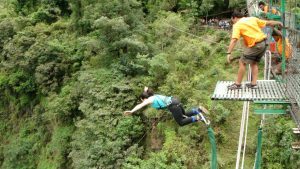 Bungy Jump Last Resort is the exhilarating adventure activity that you can experience in Nepal.After 3-hour ride from Kathmandu, The Last Resort is located on top of a gorge close to the Tibetan border. Luxurious safari tents are set in lush gardens for a peaceful stay in an exotic setting. The Bungy Bridge happens to be the only privately owned bridge in Nepal. It has been specially designed for bungy jumping with a 4x-safety factor and has a loading factor of 41,500 kg or 4.5 tons according to Swiss measurements. For bungy and swing the weight limit of jumpers is minimum 40kg and maximum 100 kg (for bungy) and 120 kg (for swing). For the tandem swing, the maximum combined weight of two people should not exceed 140 kgs. 3 hours outside Kathmandu by Ultimate Bungy Shuttle to within 12km of the Tibet Border. Swiss designed, especially for bungy jumping with a 4x safety factor. The bridge has a loading factor of 41,500kg or 4.5 tons. And those are Swiss measurements! The bungy bridge is the longest in Nepal and also the only privately-owned bridge. Before its construction, locals walked five hours to cross this river gorge. Ultimate Bungy at The Last Resort in Nepal may be the most spectacular Bungy Jump on the Planet. This the last report remarkable 500ft (160m) drop into the Bhoti Kosi River gorge on the Nepal/Tibet border is the longest free-fall in the world. Designed, constructed and operated by very experienced Kiwis to exacting international standards your safety is guaranteed. It is Nepal’s Ultimate Rush., Imagine a bridge over a 160-metre tropical gorge with the Bhote Kosi, one of the world’s wildest rivers raging below… Now Jump. Please contact us for the rate and booking of Bungy Jump at the Last Resort.